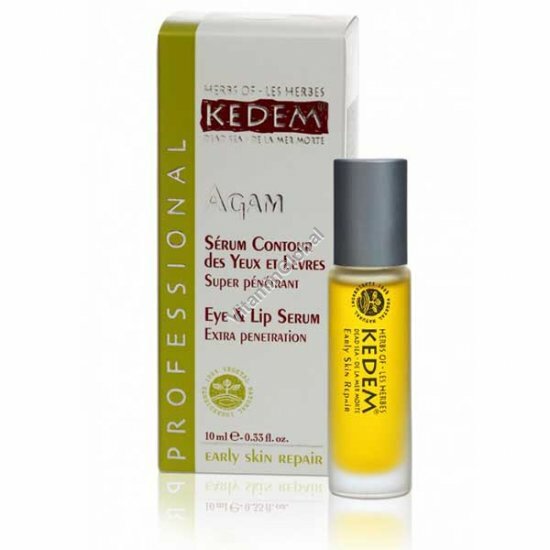 Protect and stimulate the regeneration cells of skin the delicate eye area and lips. Agam consists of plant minerals, unsaturated fatty acids OMEGA 3, 6 and 9, which regulate the balance of the skin and stimulates blood circulation. It is rapidly absorbed, is not greasy and helps smoothen wrinkles and reduce puffiness. Ingredients: rosa moschata (rose hip) oil, cannabis sativa (hemp) seed oil, cucumis sativus (cucumber) oil, passiflora edulis (passionflower) oil, simmondsia chinensis (jojoba) oil, salvia officinalis (sage) oil, elaeis guineensis (palm) oil, aniba rosaedora (rosewood) oil, camellia sinensis extract, helichrisum italicum (everlasting) extract*. Usage: Morning and evening, on clean skin, apply a little amount and absorb the serum with the fingertips around the eye and lips.